I have always been a gear snob. It is much to my wife's loathing that I typically go for the best of best when I am purchasing new hunting equipment. Need a .308 for hunting Mountain Lions? We all know any decent bolt action rifle with do the job, nope I have to order a custom built AR10 with personalized graphics. So I was a bit surprised when I walked out of the traditional bow shop with a used economy bow in my hands. New, the Samick Sable recurve was only a mere $175, I had picked up the used version for only $125 and there was not even a scratch on it. I had not even intended to purchase a bow that day. This is plight that many sportsmen find themselves in when venturing to their local favorite hunting shop. 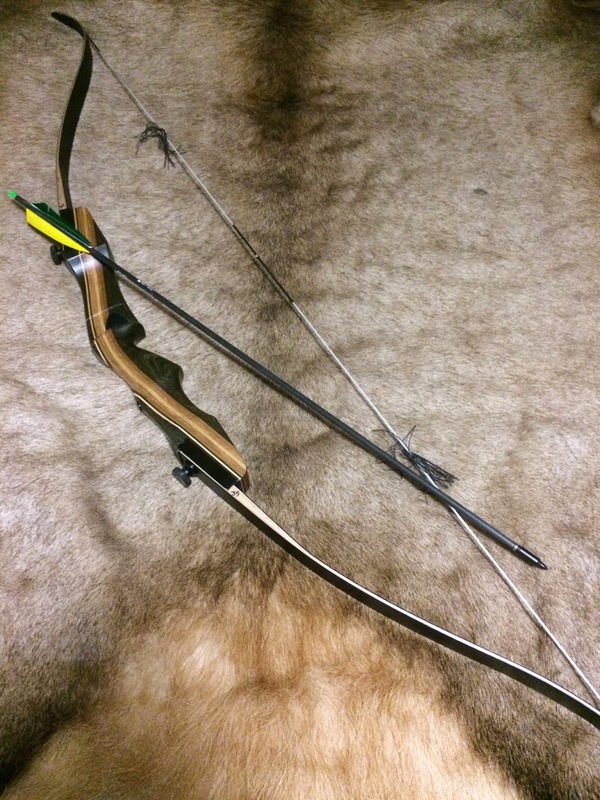 An innocent errand for some simple supplies somehow turns into a new rifle or bow, and the creation of wonderful tale to explain to the Mrs. why such a purchase was absolutely necessary. This new bow did not need such a tale, this bow was a lesson. One that I desperately needed, and had the good fortune to both ask for and swallow my pride and accept. I had ventured to Rocky Mountain Specialty Gear, https://www.rmsgear.com/store/pc/index_new.asp, in the quest to for some cedar arrow building supplies. I have long dreamed to be a pure traditional archer, using just a longbow and wooden arrows. While I have dabbled in bare bow shooting for the past 10 years, last season I officially took off the training wheels and hunted with a Fred Bear Montana Longbow. Any aspirations I had of returning to compound archery died at the same time the 5x5 bull elk did that had fallen to the wooden arrow from said bow. To say I was hooked on traditional archery was an understatement. The only thing that had not completed the achievement was that fact the arrow I used had been built by someone else. While I truly appreciated all the guidance and assistance the person who built the arrow had given me, it was still his. I vowed to learn to build arrows for myself this season and take my journey into the traditional world one step further. I had been sent to the RMSG by another master of traditional archery, who had recently graciously given me a lesson in wooden arrow building. His quote was they had some of the best raw shafts, and would fit the spine and flight specifically to my bow and draw length. Shortly after arriving and shooting a few raw shafts it was proven he was not wrong. RMSG was amazing, I have never seen such a collection of traditional bows and supplies matched anywhere else. The gentleman assisting me was both kind and patient, he later introduced himself as Logan. He even did not comment when I explained that I often battle short drawing the bow and not getting all the way to my anchor point. I have never had my traditional draw length measured and was shocked to find it was only 25.5 inches. My compound draw length was 29.5 with a string loop and release. Despite thousands of arrows in practice with the longbow I have never even considered myself proficient, and my shooting at the bow shop proved this so. What I have always been decent at is reading people and I could tell that Logan wanted to saying something, but was holding back. I asked him for his opinion of my shooting, and he cut right to the chase, you are doing everything wrong was his reply. That was it, I could turn away or perhaps learn a lesson and at worse lose a few minutes of my time. An hour later Logan had me stacking arrows on top of each other and drawing at 30.5 inches. It was a complete rebuild of my shooting stance and anchor point. Parts of it were not to far from my compound stance and at times felt more natural than the other way I had been taught before. The only problem? I could no long draw my longbow. 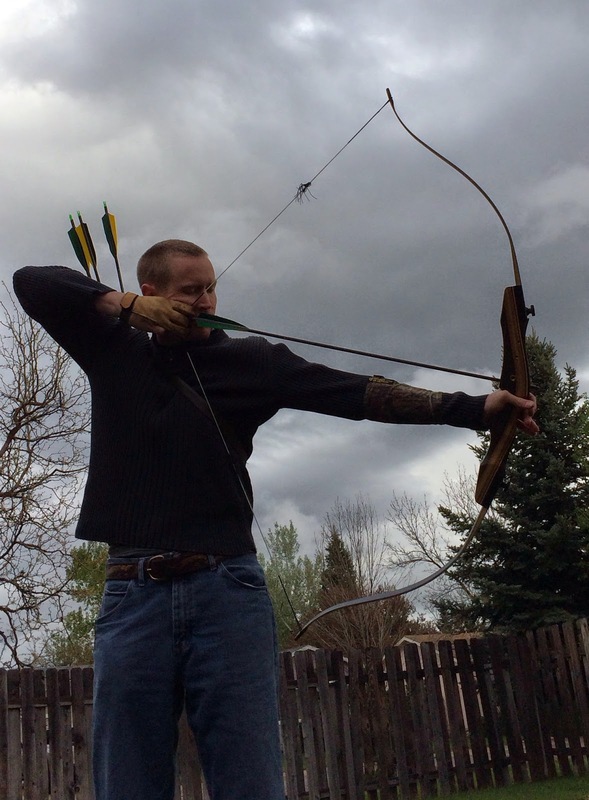 The Montana Longbow bow was 55 pounds at 28 inches, my new draw length was pushing the bow past the 60 mark. There was no way I could learn to shoot the new style with that weight, if ever. I was forced to make the decision to abandoned the arrow building until I had a set shooting style and bow. Logan suggested a lighter draw weight bow as a training bow, until I built the muscle mass necessary to draw the heavier weights. The 35 pound Sable I had been shooting for the last hour fit the bill, and ended up going home with me. After nearly week of pure form practice, I started shooting a blind bale to start working on the release and follow through. This involves working on your form and ignoring the aiming portion of shooting. To make sure I am really doing this I am closing my eyes and focusing on feeling the draw and the shot. I have to say for a cheap bow the Samick does a decent job. It is decently smooth and fast for the poundage. Closing thoughts this time are mine. Don't be afraid to admit ignorance to learn something new, it might just be one of the better lessons you will learn. Great post...You have shared some useful information.To Buy Rifle Scopes Online, there are some store where you can get the thing which you want. Greetings! I’ve been following your site for a long time now and finally got the bravery to go ahead and give you a shout out from Lubbock Texas! Just wanted to mention keep up the fantastic work! Enjoy every minute on your next adventure in the Europe and Archery Cloud is your perfect guide to find out the best hunting tool. Magus Bowman archery competition is coming once again.